As the conflict enters its fifth year, Médecins Sans Frontières / Doctors Without Borders (MSF) is supporting a network of more than 100 clinics, health posts and field hospitals and bringing vital healthcare to a population severely affected by years of brutal conflict. The third and final interview of our three part series with Syrian medical staff; explaining how vital emergency healthcare reaches people in spite of the huge challenges that entrenched and bloody conflict brings. The Directorate of Health for Hama region is a network of medical facilities set-up by Syrian doctors to provide medical care in areas controlled by rebels. The day Dr Dobbis gave this interview, the town of Kafr Zita was bombed earlier in the morning. Four people were killed and nearly 25 were wounded. 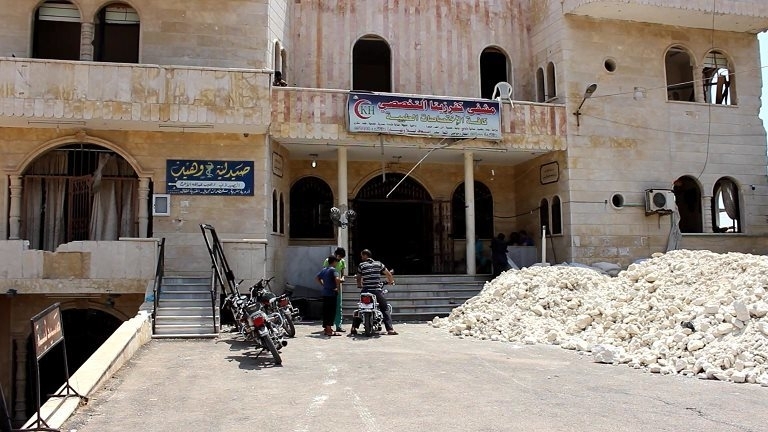 The director of the Hama Directorate of Health was on site to coordinate the surgeons and the medical centers. 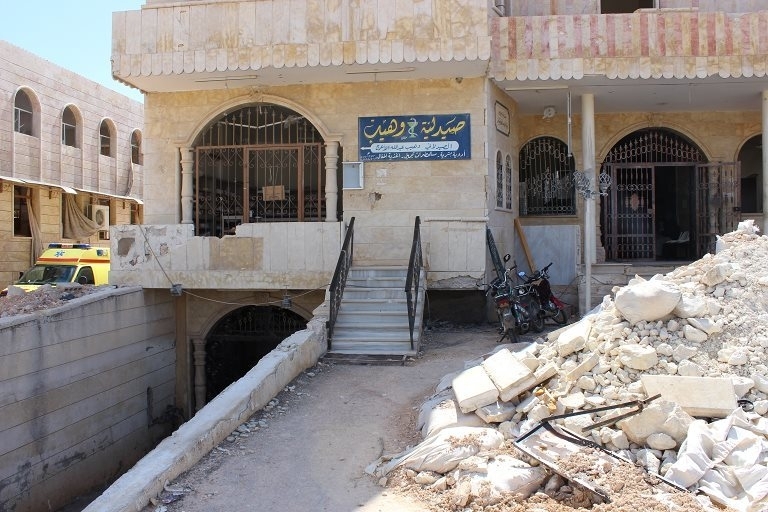 Although Kafr Zita hospital was badly damaged by shelling, a Syrian medical team keeps working there, in the basement. MSF supports this hospital with drugs and medical material. "The town of Kafr Zita is in northern Hama, on the front line. The regime controls the area to the south. The front line is bombed constantly, every day. Kafr Zita is a town of 25,000 inhabitants. People have fled because it’s become too dangerous. They’ve taken refuge in surrounding areas. When the skies are clear and cloudless, the planes take off to bomb inhabited areas and helicopters drop barrel bombs full of explosives. People prefer the winter because they are less exposed during that time of year. It is a three-story building that has been targeted several times by helicopters and planes. Now there is only one story remaining where we can work: the basement. Four surgeons are working there, with a student assisting them. They have three operating rooms and a radio. The town’s other hospital is closed. It was destroyed by a barrel bomb. The village of Alatamneh is four kilometers from Kafr Zita. No one lives there anymore. Sometimes, when the village isn’t being bombed, townspeople pass through just to pick up a few belongings. A medical post has been set up in a cave dug in a hillside next to Alatamneh, near the government lines. A surgeon, nurse anesthetist, surgical assistant, and a nurse are working there on an ongoing basis. They have four rooms—for surgery, emergencies, the pharmacy and radio, and one with two beds for post-surgical patients. However, the wounded don’t stay long. One or two hours after surgery or anesthesia, an ambulance takes them to a hospital. The people who work at the medical post bring drugs and one week’s supply of food with them. They work and sleep there. After two weeks of work, they take a two-day break, if they can. Healthcare provided through the medical network, whose activities we coordinate in the Hama region, is not limited to the wounded. We’ve created a new medical network in the region because the health care system had been destroyed. We administer vaccinations and treat chronic illnesses and common medical needs. The displaced persons who have settled in areas that are not under attack need medical care, too. When we realised that, we opened an initial clinic in January 2013, in eastern Hama. As the situation changed in the field, field hospitals were converted to clinics. Now there are eight. In Tarmala, there is a pediatrics department and an obstetrics department, where Caesarean sections can be performed. It’s the only hospital in the region providing this care and it is open seven days a week, 24 hours a day. The people living in that area cannot go to hospitals in government-held areas."